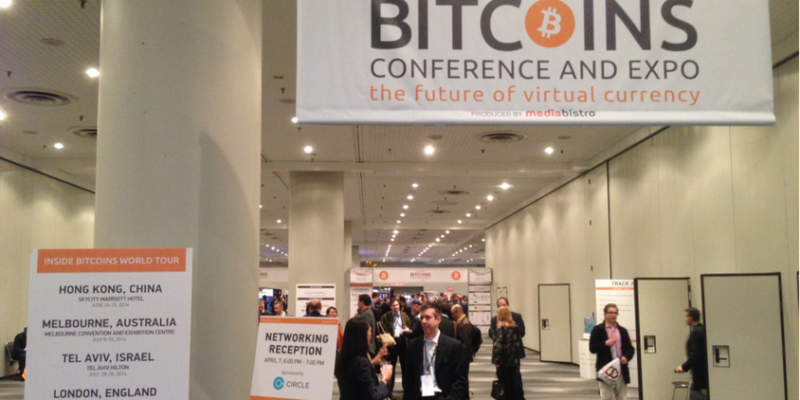 More than 2,000 digital currency enthusiasts gathered at the Javits Center in New York City on 7th April for the city’s second Inside Bitcoins conference and expo, organised by Mediabistro. Attendees traveled to New York from more than 30 countries and 38 US states to hear speeches from industry leaders about the usual topics, such as the future potential and big-picture implications of bitcoin for consumers and the financial markets. As the day progressed, though, panelists began to emphasize the opportunities of bitcoin 2.0 and applications of the bitcoin protocol beyond currency, and notably turned attention to the topic of governmental regulation of digital currencies. The event kicked off with Alan Meckler, the CEO and Chairman of Mediabistro, who welcomed the crowd and noted the dramatic increase in attendance from last year’s Inside Bitcoins NYC event, which he said had just over 150 attendees. This was evidenced by the number of startup companies who signed up as exhibitors and showcased their work in a variety of fields, including mining, cloud storage and regulatory compliance consulting. 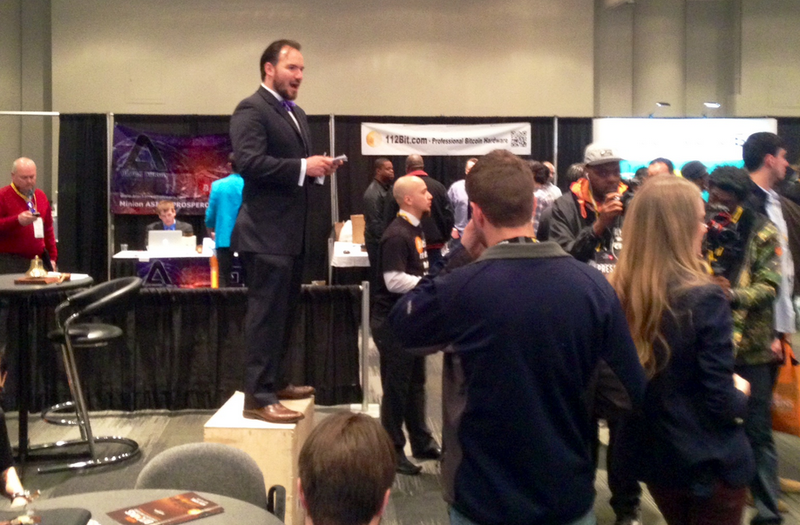 Conference attendees lined the exhibition hall during the lunch break to learn more about the diverse offerings of exhibitors, and even participated in a live bitcoin trading session hosted by the Bitcoin Center NYC. Day one of the conference played host to a diversity of topics discussed by a wide range of industry professionals. Panels focused on issues such as regulation, mainstream adoption, the startup ecosystem and security, among others. Unsurprisingly, the variety of topics brought with them a variety of opinions and viewpoints. More than once when questions were fielded from the audience, members of the panel made a point to speak up in opposition of their fellow panelists’ perspectives. In a panel titled ‘Moving Bitcoin Forward: Bringing Trust, Legitimacy and Transparency to the Market’, moderator Michael Terpin, co-founder of BitAngels, asked for a show of hands as to which area holds the most importance for increasing the number of bitcoin users: ease of use, security, regulation, public perception, economics, or liquidity? While there were votes for each of the five areas of concern, there was a clear majority consensus that bitcoin’s ease of use is the most important factor in growing the industry; members of the panel agreed. One recurring theme across the board from Monday’s panels and keynote speeches was the notion that the digital currency industry is rapidly evolving, and that it has already come a long way since its humble beginnings in 2009. During a panel discussion titled ‘New Ideas in Bitcoin’, speakers highlighted the emerging ideas in digital currencies that expand beyond bitcoin’s use solely as a currency. The topic of regulation was a primary focus in many of Monday’s panel discussions. A number of different viewpoints on regulation were presented from panelists, but the popular stance seemed to be that some level of regulation will be necessary in order for bitcoin to achieve mainstream adoption. Other panelists, like Izzy Klein of Podesta Group, believe that regulation is inevitable. Educating regulators about bitcoin’s underlying technology and its value for the global economy is paramount for productive and meaningful regulation, Klein said. The first day of Inside Bitcoins NYC drew a large crowd with diverse interests and opinions, and the variety of panelists and discussions ensured that the conference offered something to appeal to everybody’s interests. Topics like regulation and entrepreneurial opportunity held a particular focus throughout the day, and though not everybody shared the same opinions, it was clear that attendees felt that they were part of a rapidly evolving and disruptive industry.